Beggars? 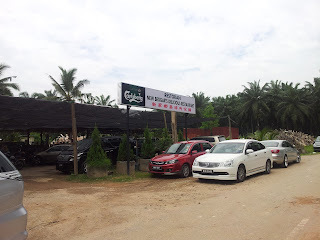 One night I was told that we shall be trying out some beggar foods in this place called IJOK. First question...beggar foods?First thing that came into mind was i think its the chicken cooked inside the the tinned foil covered with mud clay. To eat it, I think I saw in the telly before, we would have to use a hammer to crack the harden mud clay. It is also known as the Hat Yi Kai in cantonese. Second question: Where is this place called Ijok...having to give back all my geography knowledge back to my teacher a very long time to go. 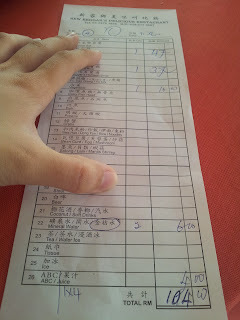 Ohh...dad actually called up restaurant the night itself to order the food. 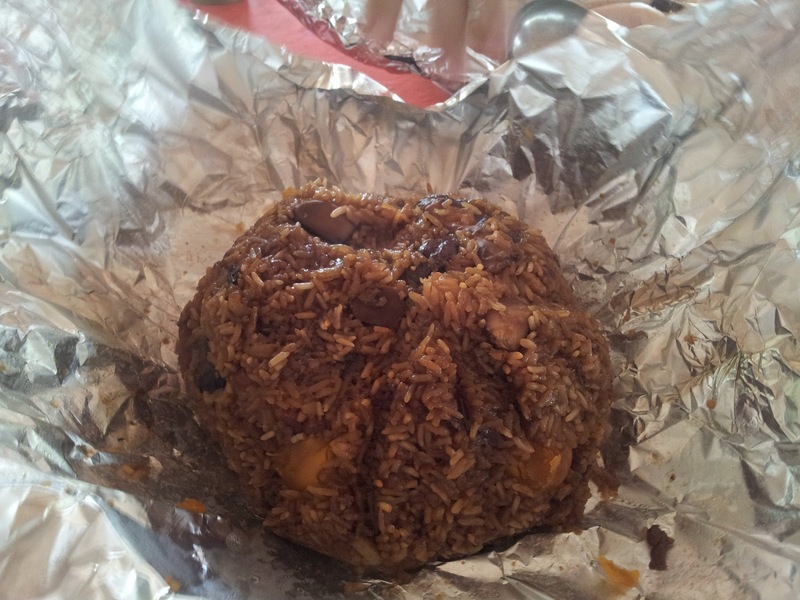 The Beggar's chicken (Hat Yi Kai) and the Beggar's rice (glutinous rice). Should be enough since we are indeed a small eater family. Found the restaurant. Amazingly, there were so many cars and so many people in a place out of no where. The restaurant was so full that the lady boss made us seat in the newly build section. After confirming our orders, we added a stir fry vegetable. 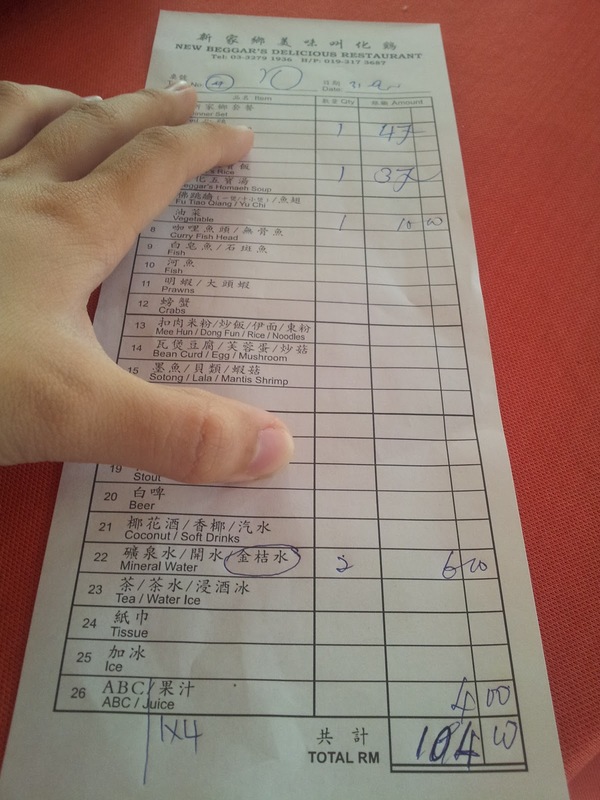 The lady boss was very nice, did not try to push us to order anymore foods. Strange!! There was no clay to break, no hammer to play. That was sad, I was looking forward to it. All of a sudden the name of the restaurant finally make sense. New Beggar's Delicious Restaurant. Ahh...its not the old school beggar's chicken...its the new version. Well, with the amount of clients they have, it is impossible to dug out the amount of clay enough for the chickens. The chicken was superb. It was a free range chicken. This bird is stuff with lots of Chinese herbs (there was yuk chok, kei chi, dong guai, yong sum sou, n a few more which im not sure what it is). It was cooked in few layers of tin foil and the soup was the key essences to it. 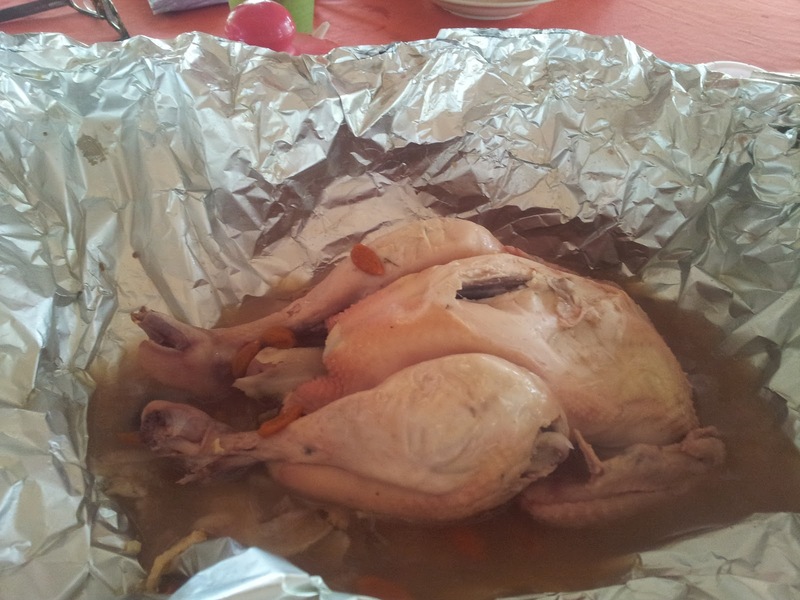 The chicken meat was tender, the smell of the dish was amazing the minute the foil was opened. This actually kind of reminds me of a restaurant in Ipoh town which sells salted free range chicken. 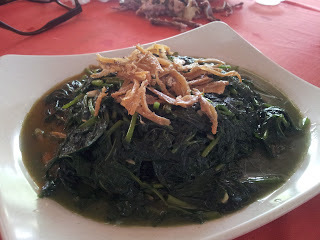 The recipe was very similar but the only differences was the Ipoh one was salted and this was not. This beggar's rice portion was humongous. This portion can feed at least 10 people. It is also cooked in the tin foil. Ingredients that I can identify was glutinous rice (obviously), mushroom, egg yolks (easily got 10 nos inside), dried mussels, fatty pork, dried shrimps, black sauce, soy sauce, lard, lots of garlic and onion, and Chinese spice if I am not wrong 5 spices. This was also cooked to perfection however I feel this has to be eaten hot as when it was expose to air, the glutinous rice started to dry out and became hard (like eating burnt rice). This is a very rich dish and I would not recommend this dish for high cholesterol and heart patients. This definitely would stuff all the cholesterol into your body and overload them in no time. As for some old folks, I know this would definitely be at their top list as the lard, the fatty pork, and tthe oil from the yolks actually softens the rice until it actually melts in your mouth. As a Dietitian, this is indeed a pretty dangerous dish and should be controlled in terms of portion even for normal healthy being. Now, I know why the lady boss walk away after we have confirmed out dishes. The portions are so big, 3 of us took only 1/3 portion of the beggar's rice and the chicken, we were already full. OMG, we still have a stir fry vegetable not out yet. Stuff stuff stuff!!! This was a disastrous stir fried vegetable. This was over cooked and the leaves were already mushy and mashed. I had a strong feeling they actually blanched the vegetables before stir frying them. The fried anchovies was just some normal garnish. I guess we shall just stick to the the restaurant's specialty cooking using tin foil rather than stir frying. 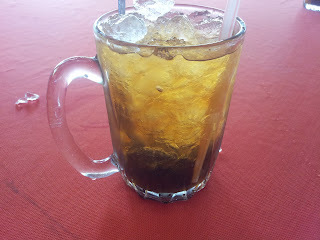 This was a very refreshing drink. The lady boss made me order this since she said they preserved the kamquat themselves with honey and secret ingredients. Sound so interesting, thats why I gave it a try. 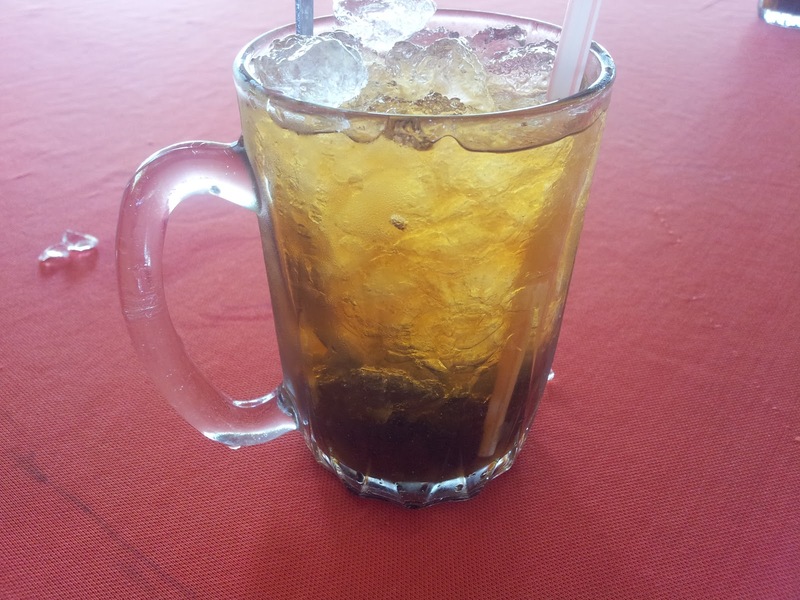 It was indeed a drink you would look forward too after such heavy meal. The foods that we ordered was only some of the good dishes. This restaurant offers other dishes like beggar's pork (should be pork throttler), beggar's duck, choice of fish (fried and garnished with ginger or steamed), praying mantis prawns, claypot soup, stir fry paku pakis and more on the list. Bring your family and friends to this place for an unforgettable food journey. Sharing is caring. All in, we paid RM104.00 for 6 person portion I suppose. Pretty reasonable. This restaurant is in IJOK, in between Rawang and Kuala Selangor. If you need any direction, feel free to call them, they are very helpful. They open on Wednesday, Saturday,Sunday and Public holidays. They actually are open by 1pm although we were once told they open at 5pm onwards. It is advisable to go during Lunch time as it would easier for you to find this place.